Cartridge yields approximately 500 pages. Proprietary pigmented ink for laser-like text. 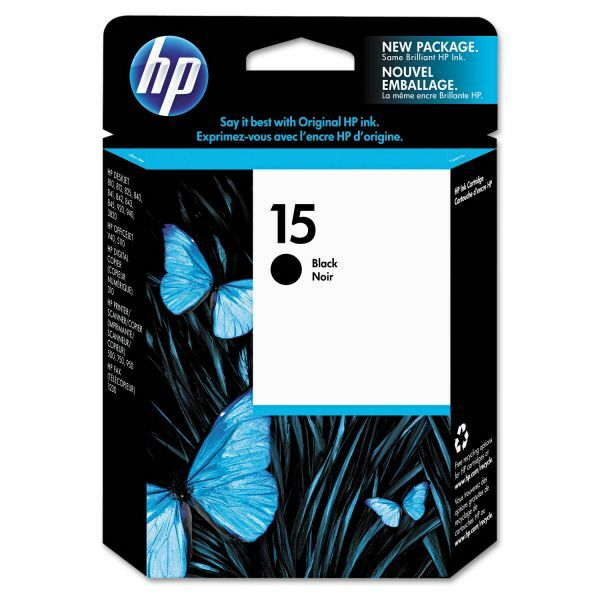 HP inkjet print cartridges for professional-quality printing. HP 15, (C6615DN) Black Original Ink Cartridge - Get professional-quality, fade-resistant printouts with crisp characters with HP 15. Depend on genuine Hewlett-Packard ink for long-lasting results. Use confidently with HP color inks, media (including transparencies), printers and printheads. Cartridge is designed for use in HP Deskjet 810C, 812C, 825C, 840C, 841C, 842C, 843C, 845 Series, 920C, 940 Series, 3820/V; Digital Copier 310; Fax 1230 Series; Officejet V40, 5110 Series; PSC 500 Series, 750 and 950 Series. Cartridge yields approximately 500 pages. High-quality output on everyday paper. 4.70" x 1.04" x 4.60"